When you first think of a boss you typically think of someone who is certainly NOT your friend. Not so here! Laci means more to us than you’ll ever know. We love her as our friend, and respect her as our boss. 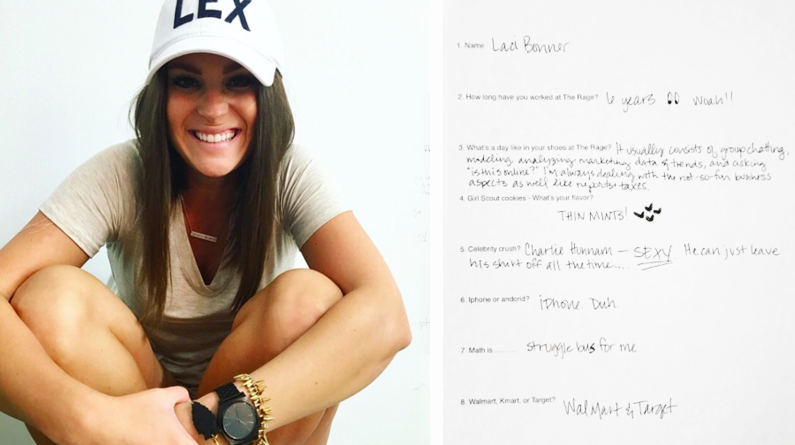 Take a peak into her survey and maybe you’ll see why we love her so! How long have you worked at The Rage? What’s a day like in your shoes at The Rage? It usually consists of group chatting. modeling. analyzing marketing data & trends, and asking “Is this online?”. I’m always dealing with the not-so-fun business aspects as well like reports and taxes. Girl Scout Cookies – What’s your flavor? Posted in Family, FYI and tagged boss, crush, fun, girl scout cookies, iphone, kmart, laci, laci bonner, math, owner, shoptherage, survey, target, therageboutique, walmart on May 11, 2016 by therageteam.